The formation of scale and corrosion on equipment surfaces restricts water flow, clogs equipment and reduces system efficiency. The results can be costly — increased energy consumption, greater downtime, additional maintenance and reduced equipment life. Because the ION ScaleBuster removes existing scale buildup on pipework, valves, heating elements including hot water heaters, electrical heating elements, industrial heat exchangers, hot water pipes and tanks, less energy is required to heat the water. The galvanic effect of the ION ScaleBuster provides a reducing effect on corrosion sites. By precipitating hardness, the treated water becomes less saturated and, therefore, is able to dissolve old deposits over a period of time. The time taken will depend on several factors—the thickness of scale deposits and the distance of effected area from the installed ION ScaleBuster. 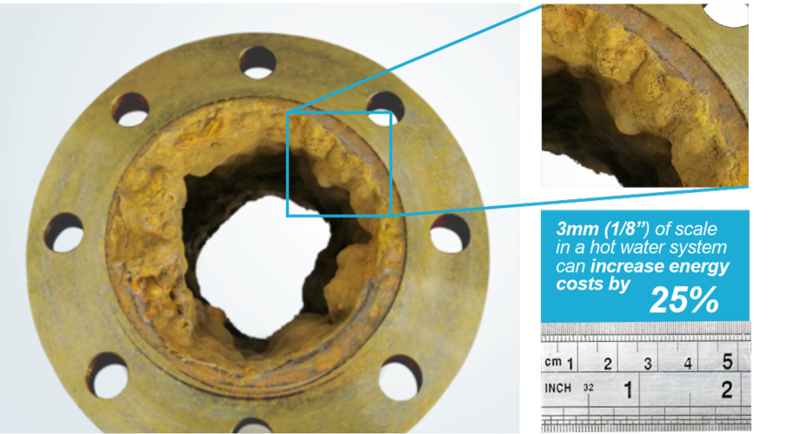 The volume of water passing through ION ScaleBuster will determine the length of time taken to clean scale and corrosion deposits from the system. However, once installed, a ScaleBuster unit will commence its job immediately provided that a water flow is still possible. Click to see the video of how ScaleBuster works. Click to see the video of how ScaleBuster can work in your municipality. Уou can buy precious metals on the website of our partner - EZOCM.